Every now and again, here at Beacon Transport, we like to remind ourselves and our drivers of just how vital we are to the American economy and to the global movement of goods. Get this: more than 70% of all freight tonnage moved across the United States goes by truck. And in fact, were it not for our hardworking Nashville trucking team and other truckload carrier companies like ours, our economy would shudder to a halt. Have you ever stopped to make Amazon tick? It’s not clicks, it’s trucks. Those delicious Georgia peaches? They didn’t fly themselves to our supermarket shelves. What about those incredible Bridgestone/Firestone tires that keep your car rolling? Yup, our trucks got them here. Pretty much everything you take for granted (or express deep appreciation for) spent part of its distribution cycle on a heavy-duty truck. To move 10.5 billion tons of freight annually requires over 3.4 million heavy-duty Class 8 trucks. It also takes over 38 billion gallons of diesel fuel to move all of that freight. Trucking Industry Revenues Were $676.2 Billion in 2016. American Trucking Associations’ advanced seasonally adjusted (SA) For-Hire Truck Tonnage Index increased 6.5% in May. Diesel fuel is often the second highest expense for motor carriers after labor and can be as much as 20% of total operating costs. 7.3 million people employed throughout the economy in jobs that relate to trucking activity. More than 3.5 million truck drivers are employed. The for-hire trucking industry is facing a shortage of drivers. 97.3% operate fewer than 20 trucks. These impressive statistics paint a picture of an industry that is changing. As transportation logistics and truckload carrier companies become increasingly focused on cutting costs and reducing inefficiencies to increase bottom lines, the trucking industry is adapting and changing rapidly. The evolution of trucking is now. We’re ready to be a part of the future and to play an active role in the American economy for years to come. We hope you’ll join our growing truck driving team. Trucks are becoming more and more efficient, technology is helping drivers connect with one another, apps now allow brokers to connect with carriers more effectively, GPS technologies are becoming ever more sophisticated, autonomous trucks are hitting the streets, and driver pay is increasing (Indeed puts the average truck driver salary around $60,000). There’s a lot going on in the trucking industry and here’s how Beacon is facing the changing times. We’re ready to face the anticipated growth in freight tonnage shipped by trucks. 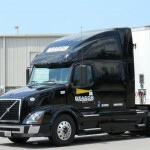 We’ve invested in our fleet, which includes late model Volvo tractors and Wabash trailers. Our in-house transportation maintenance team, led by Chris Callis, keeps our fleet in shape. More uptime means more hours on the road. Our fleet is equipped with Qualcomm satellite systems for increased driver communication and seamless shipment tracking. We believe that effective fleet management systems keep our freight, our clients, our company, and our drivers moving forward. At Beacon Transport, we understand that our drivers are the lifeblood of our business. Our driver-oriented dispatch team, led by 20-year industry veteran Randy Cummins, helps make it possible for our drivers to perform at their very best. We keep safety, time, and efficiency top-of-mind. Beacon Transport is part of the SmartWay® program. It’s an EPA program that reduces transportation-related emissions by creating incentives to improve supply chain fuel efficiency. We strive to be not one of the best, but the best trucking company headquartered in Nashville. Our drivers are partnered with experienced dispatchers and can expect no-touch freight, EZ Pass, Pre-pass, great benefits, and layover, stop/pickup, and detention pay and more. We even make it easy to apply for a truck driving job online. Ready to become part of the next generation of trucking? Contact Beacon Transport today.